Physical inactivity was recognized as an independent cardiovascular disease risk factor. Recent studies have documented that many health-compromising behaviours that lead to adult morbidity and premature death, such as the poor dietary and exercise habits, begin during adolescence. Educational actions are essential in developing countries where lack of resources for pharmacological and intervention research occur. Health and physical education programs are cheaper and more feasible. Unfortunately, our people are ignorant of the role so deleterious of the diet and sedentary behaviours in the genesis of the cardiovascular diseases. In Mexico, there are very few reports concerning educational programs as a means to prevent chronic diseases. Mexican students rarely have knowledge around physical exercise and healthy lifestyles. The purpose of this study was to determine the impact of Health Education Program on knowledge of risk for heart disease in adolescents students. Evaluation for heart disease risk factors. Performed a treadmill stress test. Questionnaire to determine their level of understanding of the lecture. Following the Health Education Program, each student completed a questionnaire, that showed their level of understanding about several topics dealt with heart disease risk factors and the relation to smoking, blood pressure, diet, and physical activity. The results of the questionnaire were tabulated and revealed that the majority (94%) of the students understood the relation between physical inactivity and heart disease, and the type of exercise training program needed to produce an increase in aerobic capacity and reduce risk factors. In addition, 83% of them were able to identify the types of foods required to compose a diet low in saturated fats and cholesterol. While 99% reported that they enjoyed the educational program, and 25% suggested that exercise testing and prescription become apart of their school program. Our results indicate that adolescents desire to participate in Health Education Programs. They enjoyed to complete a physical evaluation and attended sessions and lectures about health promotion topics. The findings from this study also confirm that a Health Education Program can increase health knowledge of cardiovascular disease and may be one way to develop health habits leading to a reduction in risk factors. In addition, knowledge is more accessible, and thus more likely to be transferred to novel situations, when it is a central or integral part of our experiences. Constructivist theory insist that health promotion can be effective, and oriented toward student experiences. The knowledge about physical exercise and health practices, as primary intervention, is probably the most important factor to prevent cardiovascular diseases, which have increased in our community from 1.5% to 20% over last 30 years. Patterns of activity and eating are established early in life. The heart attack of middle age has its root in childhood. Therefore, education should be a major component of every program of exercise, and educational programs should aim for control of cardiovascular risk factors early in life. Current research on risk factors in adolescents is focused on interventions aimed at reducing the risk of heart disease through the earliest establishment of a risk-reducing lifestyle. These studies suggest that preventive efforts on maintaining physical activity through puberty will have favourable health benefits in later years. 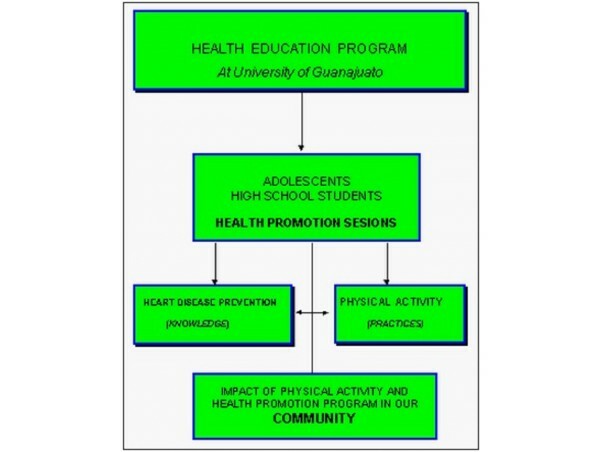 Health promotion activities developed by University of Guanajuato, Mexico should provide mutually reinforcing. One mechanism to implement this goal would be to develop community coordinating committees involving medical services, families, schools as well as adolescents, to identify and implement a comprehensive strategy of adolescent health promotion for each specific locale.